Slim Borgudd only scored one point in his brief time in Formula One, but he was an accomplished racing driver as well as being successful in his other life as a musician. Anyone who can race in a grand prix and lay claim to being a drummer with ABBA has got to be a bit of a hero. Karl Edward Tommy Borgudd was born in Borholm on the small island of Oland in Sweden in 1946 and followed a career in music. Motor racing was something in which he developed an interest as a small boy when he watched Stirling Moss win in 1959 at Karlskoga, but Borgudd the racing driver was many years away. Borgudd the musician began his career in 1961 when he joined the Lea Riders Group - he wasn't even 15 when he picked up his drumsticks for the school-based band. The band underwent many manifestations but three mainstays were: Bo Haggarstrom (electric bass), Sigge Ehlin (guitar, harmonica and vocals) and Borgudd. By 1966, the group had grown up and left school and was in demand for gigs in Stockholm as well as on television. The group broke up in 1968 and Borgudd and Haggstrom joined Georg Wadenius to form Made in Sweden, a progressive jazz rock fusion group. Although the band wasn't a hit in period, Swedish music aficionados are now appreciating the impact the band had on the regional music scene. Albums called With Love, Snakes in a Hole and Live! At the Golden Circle followed but the band split up in the early 1970s. The effects of ABBA's music were changing the Swedish scene and there was little demand for groups like Made in Sweden. The members went their separate ways and Borgudd joined Solar Plexus and freelanced with the Hootenanny Singers. By this time, he had started racing. In the 1960s he toured Britain and met Chris Barber, a jazz band leader and enthusiastic amateur racer. Barber was able to combine racing with his music and Borgudd realised that he could do the same. He bought Barber's Lotus 22 and shipped it back to Sweden to race in club events. He was in his late 20s by this stage, but quickly threw himself into his racing in the Lotus before moving to the Swedish Saloon Car Championship. He raced a Volvo 122S, another car imported from England, and combined this with Formula Ford racing. In 1973 he took the Scandinavian title and tried Formula 3 in 1975 before having sporadic outings in 1976. Money was tight but he was determined and gave the races his all. Where possible he scrounged drives and raced Tore Helle's Viking Formula 3 car, the car appearing on the cover of Borgudd's solo album Funky Formula. Borgudd plugged away with limited funding in 1977 and even set up his own team to run a Ralt RT1, now past its best, in 1978. He tackled the European Formula 3 Championship when he could, competing at Donington and Silverstone. Although he was struggling with older equipment, it was his heroics in the European Championship races that caught attention; he finished third in the 1979 Championship (won by Alain Prost) as well as winning the Swedish title that year. At 33, Borgudd needed to step up. Money promised to him from Marlboro never appeared for 1980, but by this stage he had made some important contacts in his music life. The Hootenanny Singers were led by Bjorn Ulvaeus of ABBA who brought Borgudd in to be a session drummer for the emerging band. It was the friendship with Ulvaeus that led to ABBA sponsorship on Borgudd's grand prix car. That came in 1981. 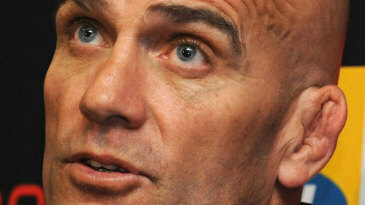 The call came from Gunther Schmid, the volatile owner of the struggling ATS team. Schmid's cars were rarely competitive and as a result he would seek to change one key component: the driver. 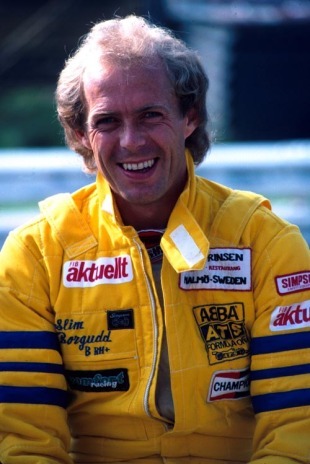 Jan Lammers had been driving for the team but relations between him and Schmid were at rock bottom. Borgudd agreed to drive the car and ABBA put its name on the side, not for money, but as a goodwill gesture to try to attract more sponsorship. Borgudd, now 34, survived the carnage at Silverstone in 1981 to finish sixth and score a World Championship point. So delighted was ABBA that all the band members turned up at the next race at Hockenheim. 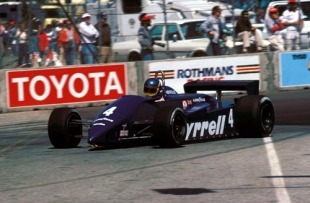 The rest of the year was a disappointment but noted talent-spotter Ken Tyrrell had signed Borgudd for 1982 but he wasn't happy in the Tyrrell and didn't receive the same attention as lead driver Michele Alboreto. He was dropped before the end of the season but at 35 years of age, he was probably too old to achieve much more in F1. With ABBA having split up, work and racing were equally difficult to come by. He picked up occasional drives when he could, including in the first year of Formula 3000, and then raced in Swedish Touring Car races again for Volvo. In 1986, though, another career began - in truck racing. The Swede was the perfect fit for the Volvo truck racing team and enjoyed great success in the sport winning the 1995 European title. By this stage he had switched to Mercedes who then, he felt, favoured German drivers. He retired from truck racing in 1997. Since them Borgudd has dabbled in touring car races in the UK and abroad but over four decades he has achieved success in music, car racing and truck racing. No-one else can rival that.